Red panda resting on a tree in Madrid Zoo. 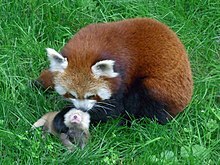 The red panda is listed in CITES Appendix I.The species has been classified as vulnerable in the IUCN Red List since 2008 because the global population is estimated at about 10,000 individuals, with a decreasing population trend; only about half of the total area of potential habitat of 1,42,000 বৰ্গ কি.মি. (55 বৰ্গ মাইল) is actually being used by the species. Due to their shy and secretive nature, and their largely nocturnal habits, observation of red pandas is difficult. Therefore, population figures in the wild are determined by population density estimates and not direct counts. Worldwide population estimates range from fewer than 2,500 individuals to between 16,000 and 20,000 individuals. ↑ Wang, X., Choudhry, A., Yonzon, P., Wozencraft, C., Than Z. (2008). "Ailurus fulgens". IUCN Red List of Threatened Species. Version 2012.2. International Union for Conservation of Nature. http://www.iucnredlist.org/apps/redlist/details/714. ↑ 2.0 2.1 2.2 2.3 Roberts, M. S.; Gittleman, J. L. (1984). "Ailurus fulgens". Mammalian Species (222): 1–8. http://si-pddr.si.edu/dspace/bitstream/10088/4231/1/Roberts1984.pdf. ↑ Pocock, R.I. (1941). Fauna of British India, including Ceylon and Burma. Mammalia. – Volume 2.. Taylor and Francis, Ltd., London. পৃষ্ঠা. 250–264. http://www.archive.org/stream/PocockMammalia2/pocock2#page/n273/mode/2up. ↑ 7.0 7.1 Choudhury, A. (2001). "An overview of the status and conservation of the red panda Ailurus fulgens in India, with reference to its global status". Oryx (Flora & Fauna International) খণ্ড 35 (3): 250–259. doi:10.1046/j.1365-3008.2001.00181.x. ↑ 8.0 8.1 R. M., Nowak (1999). Walker’s Mammals of the World. 2 (sixth সম্পাদনা). প্ৰকাশক Baltimore: Johns Hopkins University Press. পৃষ্ঠা. 695–696. ISBN 0-8018-5789-9. ↑ Yonzon, P. B., Hunter Jr., M. L. (1991). "Conservation of the red panda Ailurus fulgens". Biological Conservation খণ্ড 58 (57): 85. doi:10.1016/0006-3207(91)90046-C.
Glatston, Angela (2007a). Red Panda International Studbook -Ailurus fulgens fulgens held in zoos in 2006. Rotterdam Zoo. http://www.rotterdamzoo.nl/import/assetmanager/1/5621/fulgensloc.pdf। আহৰণ কৰা হৈছে: 2009-09-13. Glatston, Angela (2007b). Red Panda International Studbook -Ailurus fulgens styani held in zoos in 2006. Rotterdam Zoo. http://www.rotterdamzoo.nl/import/assetmanager/4/5624/STYANILOC.pdf। আহৰণ কৰা হৈছে: 2009-09-13. ITIS (USDA Integrated Taxonomic Information System). 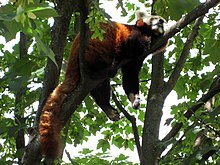 "Ailurus fulgens (Taxonomical Serial No. : 621846)". http://www.itis.gov/servlet/SingleRpt/SingleRpt?search_topic=TSN&search_value=621846। আহৰণ কৰা হৈছে: 2009-10-24. IUCN/SSC Mustelid, Viverrid, and Procyonid Specialist Group (1994). A. R. Glatston. ed. The Red Panda, Olingos, Coatis, Raccoons, and Their Relatives. প্ৰকাশক Gland, Switzerland: IUCN. ISBN 2-8317-0046-9. http://data.iucn.org/dbtw-wpd/edocs/1994-015_en.pdf। আহৰণ কৰা হৈছে: 2010-01-09. Slattery, J. Pecon; O'Brien, S. J. (1995). "Molecular phylogeny of the red panda (Ailurus fulgens)". The Journal of Heredity (Oxford University Press) খণ্ড 86 (6): 413–22. PMID 8568209. Miyashiro (2006-08-25). "Background information on the question: "Do Pandas Really Exist?"". New Mexico Tech. http://infohost.nmt.edu/~biology/EvolutionWeb/Miyashiro/PandasBackground.pdf। আহৰণ কৰা হৈছে: 2010-01-09. Naish, Darren (2008-04-03). "Nigayla-ponya, firefox, true panda: its life and times". Tetrapod Zoology. http://scienceblogs.com/tetrapodzoology/2008/04/03/proper-pandas/। আহৰণ কৰা হৈছে: 2010-01-09.